Ahhhhh! Can you believe the penultimate episode of Crazy Ex Girlfriend has arrived. I am writing this on the day of the finale and it's just hitting me that my favorite show is almost over! I have had such a nice time blogging about this series over the last 2 years. This episode was beautiful!! The three dates were gorgeous. I felt like the Crazy Ex Girlfriend writers were trying to write a love letter to all three of our leading men. They aren't trying to vilify any man. In less evolved shows, there is the jerk and the guy our lead ends up with. Here, we have seen all three men grow. We have fallen in love with all three, and now we get to see each one shine one last time. Josh/Rebecca: I almost cried during their date. This show - the show that I love, Crazy Ex Girlfriend, started because of this ship. Josh recreated them being at summer camp. Throughout season one, summer camp was Rebecca's symbol of bliss. It's nice to see her live it one last time. Nathaniel/Rebecca: I had high expectations for this date because I did become a Nathaniel/Rebecca shipper during season three. Nathaniel did meet those expectations because the scenery of the picnic was beautiful. The fact that he found a concert that she would love AND find a place where she could hear it for free showed that he did a lot of research. Also, their dancing was so cute! It was a freeing kind of dance. Nathaniel was very tightly wound in season 2, and Rebecca also takes her love like very seriously. Those two dancing felt airy, nice, and free. Greg/Rebecca: When Greg bought the air balloon ride, I was fuming because I didn't want to see Greg do something so against his character. Both Josh and Nathaniel kept pieces of who they were during their dates. I wanted Greg to do the same. I'm glad Greg's car died before he could get to the hot air balloon ride. This gave Greg and Rebecca a chance to be real with each other. There was no gimmicky date between them. It was just two people talking and laughing and eating and doing errands together. It was so cute!! We ended this episode widening out from a shot of Rebecca and Greg laughing and talking to each other. Then Greg says, abruptly, "You are the love of my life." Amazing. That really got me. One thing to keep in mind is that Nathaniel and Josh said some version of, "We belong together," or "We are meant to be." Nathaniel and Josh are still forcing their feelings on Rebecca. They are still relying on fantasy and fate. Greg, on the other had, is just stating his feelings. He doesn't need Rebecca or the universe to be on board. He know that he loves her. This is why Greg is end game. Love's Not A Game: White Josh gets to embody one of the most beloved theater characters of our time - Enjolras from Les Miserables! I don't know THAT much about musicals so Enjolras is the first thing that came to mind when I saw this song. "How dare you play with love? Have you no decency?" The dramatics of this monologue reminded me of "Red and Black" from Les Miserables. "Love's Not A Game" is a hilarious, group number. I loved it when White Josh calls Paula, "lady sir," and she responds with, "I think the work is 'ma'am'." There was a call-back to "Pre-school? No, Priest school," which I loved! 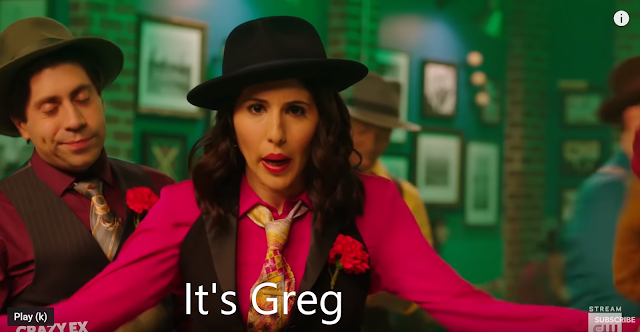 I thought Valencia looking into the camera and saying, "It's Greg," was a little too on the nose. LMAO. It was subtle, but I caught it. Love's Not A Game (Reprise): A touching and reflective moment. Rebecca: "I retired from stalking, but you never loose the skills." The opening of this episode was hilarious. You see Dr. Akopian order coffee and all of a sudden, Rebecca's head pops out! HILARIOUS! The Other Rebecca moment was one of my favorites this time!! Rebecca popping in to say, "Perfection is an illusion!" The show ends on Valentine's Day. "It's apt. Very apt." LOVE THIS SHOW. Valencia: "Greg's a different actor now and by actor, I mean in the political legal sense." Greg's Advantage: Little remarks and comments. A wonderful show! I am sad to see it go. Can't wait for the season finale which I get to watch in 1.5 hours from now!